SOME PEOPLE JUST WANT TO SEE THE MARKET CRASH | F.A.T. 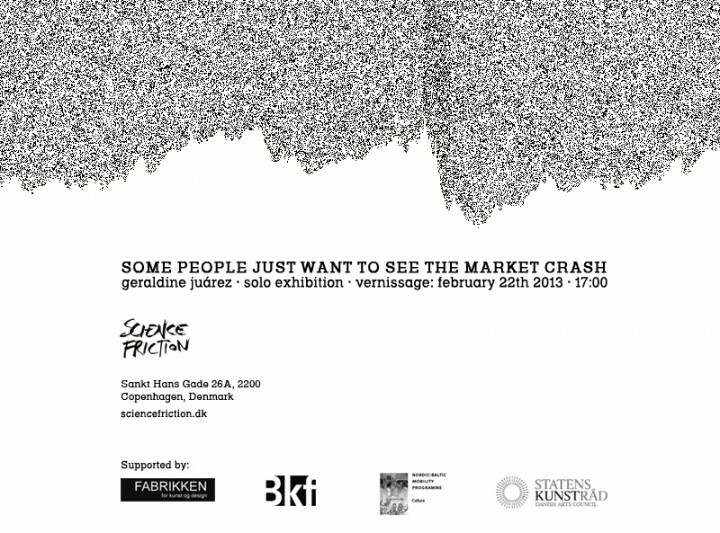 For her first solo show in Copenhagen, Geraldine Juarez is taking on the stock market. The well-known zigzag lines representing the movements on stock market indexes such as the NASDAQ, Dow Jones or the CAC40 are at the core of Geraldine Juarez’ work for the current exhibition. The esoteric quality of the financial market renders it somewhat cultish with its weight on the world, its interpreters like high priests and its temples on Wall Street. Geraldine Juarez’ works for the current exhibition play into the cult-like nature of the stock market by mirroring the fundamental value behind financial transactions and its symbols, i.e. gold. The gilded 3D prints of various stocks and equity prices become pieces of pop culture jewellery as does the elegant gold and mirror representation of the 2010 flash crash – the fastest stock market crash to date, where the market crashed in seconds only to recover its losses minutes later.